Product categories of Calcined Aluminum Oxide Abrasive Belt, we are specialized manufacturers from China, Calcined Aluminum Oxide Abrasive Belt, Abrasive Grinding Belt suppliers/factory, wholesale high-quality products of Calcined Abrasive Soft Abrasive Belt R & D and manufacturing, we have the perfect after-sales service and technical support. Look forward to your cooperation! 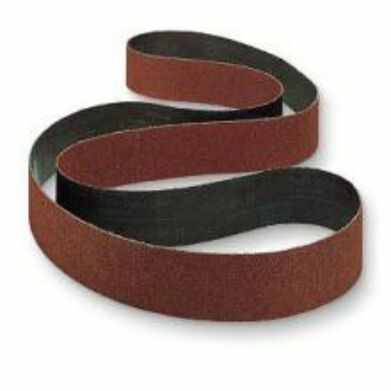 Abrasive belts belong to coated abrasives. It is also called flexible abrasives. When polishing, it is more flexible and safe than the solid grinding wheel, and it has the advantage of higher precision and lower cost. Calcined aluminum oxide has the advantage of quite small coefficient of expansion, excellent hydrophilicity , great toughness and great great strength. Calcined Aluminum Oxide Abrasive Cloth usually used for polishing stainless steel, hard metal, titanium alloy, casting metal and welding lines. After 30 years` development, Abrasive Cloth grinding has become a complete and self-contained system of new processing technology. Because of its high processing efficiency, wide application range, strong adaptability, low cost, safe and convenient operation, it is well received by customers. In foreign countries, Abrasive Belt grinding technology has made great progress. It can be applianced for more and more processing object . It can process almost all engineering materials, from the general daily life appliance to application of large aerospace equipment. If you have any questions, please contact with us directly. The abrasive cloth are produced with high quality and good appearance. Welcome you can visit our factory for inquiry. Please send mail directly to us. Copyright © 2019 Jiangsu Fengmang Compound Material Science & Tech Group CO.,LTD All rights reserved.